Metagenics - Endura (Lemon-Lime) - 1.47 Lb. 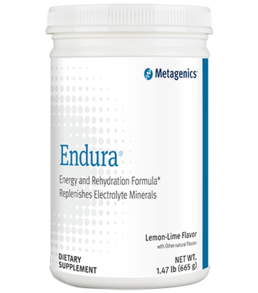 Endura is a rehydration formula mix with a unique blend of electrolyte minerals that are found in muscle cells. Provides carbohydrates in the form of glucose polymers and fructose, delivered in a special, balanced blend designed to help delay the onset of fatigue during strenuous activity. Delivers key electrolytes to help replace those excreted through sweat during exercise, activity, and/or hot weather conditions. Is designed to provide high concentrations of absorbable magnesium, a mineral essential for cellular energy metabolism and glucose homeostasis. Available in delicious, all-natural Orange and Lemon-Lime flavors. As a dietary supplement to help maintain adequate hydration, thoroughly mix one heaping scoop (35 grams) with 16 fluid ounces of water. For athletes, drink Endura 15 to 20 minutes prior to a race or training, and every 15 to 20 minutes throughout the event. Patented mineral amino acid chelates: U.S. Patent #5,516,925 Albion;. Endura; contains no sucrose or artificial sweeteners.